Alenia Aermacchi (Finmeccanica, Stand G55) is promoting two new roles for the M346–companion training, and dissimilar air combat training (DACT). “Our existing customers told us it would make an excellent aggressor,” company test pilot Giacomo Ianelli told The International Fighter Conference in London last November. Singapore was the first export customer for the Italian jet, and operates 12 of them for advanced pilot training at Cazaux airbase in France. Israel, Poland and the UAE have since joined Italy and Singapore as customers. 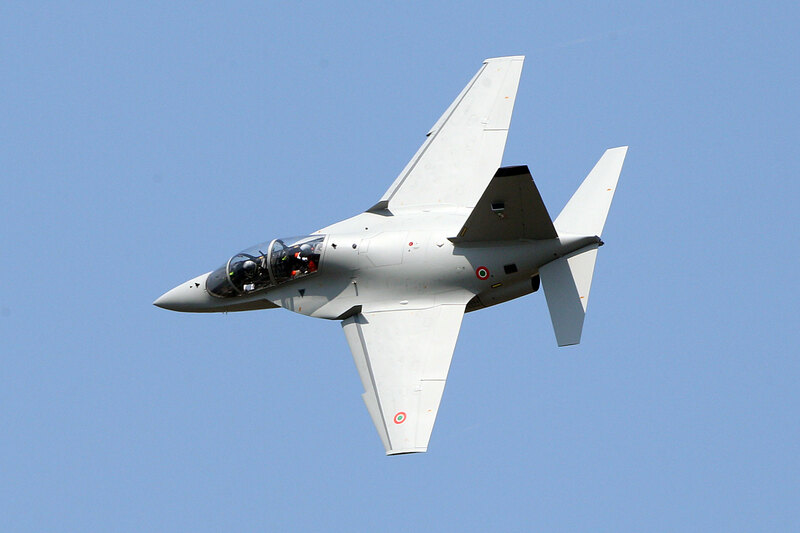 Ianelli claimed that the M346’s performance is second only to afterburner-equipped aircraft. “We’ve just cleared 30-degrees AoA [Angle-of-Attack] carefree handling, and look at our turn rates!” he exclaimed. Various g-force and AoA combinations are selectable in the flight control system of the M346, to help replicate the behavior of enemy aircraft, he noted. With external tanks, the M346 has a maximum range of 1,470 nautical miles and, since it is equipped with an inflight refueling probe, the endurance can easily be extended to more than four hours, Ianelli said. “Therefore when acting as Red Air, we can stay airborne for two exercise waves,” he added. The test pilot presented diagrams showing that while the M346 could complete typical training-aggressor mission profiles, including two 10-minute combat maneuvering sessions, afterburning aircraft such as the F-5E fighter or the rival T-50 trainer would run out of fuel after only one such session. The M346 has an embedded tactical training system (ETTS) that emulates radar, targeting pods, weapons and electronic warfare (EW) systems, and the Multifunction Information Distribution Systems (MIDS). It can also carry “real” external stores such as dispensers for BDU-33 and Mk106 practice bombs; a 12.7mm gun pod; captive IRIS-T or AIM-9L air-air missiles; and an active EW pod. The ETTS supports both standalone and distributed, e.g. networked, operations. In standalone mode, data for preplanned airborne scenarios can be prepared before flight in a mission support station and uploaded to the M346 via a data-transfer module. Alternatively, the jet’s datalink allows real-time communication with a real-time monitoring station (RTMS) on the ground, where an instructor can computer-generate forces. The M346 ground-based full mission simulator can also be datalinked, of course. By such means, “We have already achieved Live-Virtual Constructive (LVC) training,” claimed Ianelli. The test pilot also listed some other M346 features and benefits. There is a helmet-mounted display with video recording for debriefing; the simulator has dynamic ‘g’-seat and -suit; and all the internal and external lighting is night-vision compatible. A ‘low-observability kit’ has been developed and tested that reduces the M346 baseline radar cross-section from 20 to 1 square meters. A large, single-screen cockpit layout has been designed, but full development awaits a launch customer. The jet could easily be adapted for light attack missions. The Italian air force is now using the M346 as a “Red Air” trainer on a monthly basis, following a successful trial at the Eurofighter operational conversion unit, at Grosseto airbase, last May. “The M346 allows combat-ready pilots to maintain airmanship and mission management skills, thanks to its excellent performance and on-board simulation.” said Ianelli in summary. Since the flying-hour cost of an M346 is only one-tenth that of a Eurofighter, there are potentially substantial savings, he added.